Fire TV Stick doesn't have external storage, but Fire TV (Gen 1 and Gen 2, but not Gen 3) does provide external storage options through a memory card slot. Generally, your app should specify external storage as the default install location. As a best practice, most apps should specify preferExternal for the installLocation in the Android Manifest file. If left unspecified, your app will be installed on internal storage. Some users may have abundant space available in external storage, but if an app's Manifest does not specify preferExternal, the app will be installed internally. As a result, users get prompted with low storage warnings or cannot install the app at all, which leads to user frustration. Selecting preferExternal helps ensure the greatest user base for your app and a better user experience on Fire devices. preferExternal Recommended for most apps. Install your app on external storage when available. If external storage is full, install the app to internal storage (if available). The user can manually move the app later by selecting it from Settings > Apps & Games > Manage All Applications. internalOnly Install the app only to internal storage. 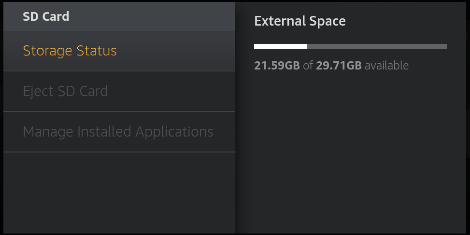 If there is not enough room in internal storage, the install will fail. The app cannot be manually moved later by the user. Not recommended for most apps. Choose this option only for the types of apps described in the next section. auto Install to internal storage by default. However, if internal storage is full, install the app to external storage (assuming external storage is available). The user can manually move the app later by selecting it from Settings > Apps & Games > Manage All Applications. Note that even though the APK file is installed on external storage, all databases, private user data, optimized .dex files, and extracted native code are stored on internal storage. See App Install Location in the Android documentation for more information. If your app plays DRM-protected media, DRM resources may become unstable if USB storage becomes unavailable. If your app plays DRM-protected media, either do not include installLocation at all, or set its value to internalOnly. See the App Install Location documentation in Android for more details. Fire TV (Generation 1) supports USB external storage and Fire TV (Generation 2) includes a microSD slot for external storage. On these devices, settings are provided for users to manage connected external storage. For apps that perform their own secondary downloads as part of first run or at any other time, these downloaded files are usually stored where the APK file was installed on the device. If the app was installed on external storage, the APK file will be on external storage. Some applications, particularly games, use secondary downloads containing additional textures, levels, or other asset files. If you are handling this download in your app code, such as part of first run initialization, use the Android PackageManager getApplicationInfo method to retrieve the ApplicationInfo class. The ApplicationInfo class contains the location of the APK (sourceDir) and the public parts of the source directory, including the resources and manifest (publicSourceDir). If the app has been installed on external storage, these paths will point to that location and indicate where users should install the additional downloaded content. If your app uses installLocation="preferExternal" to install a 40MB APK onto external storage, but then stores a 1GB downloaded data file to internal storage because the app uses the ApplicationInfo dataDir path, this would defeat the purpose of using external storage and quickly fill up the device's internal storage, leading to customer frustration. 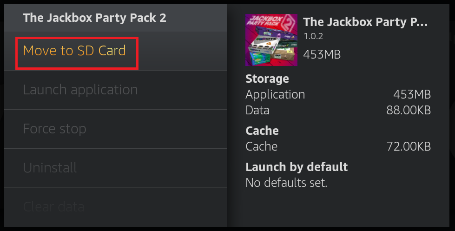 Therefore make sure the secondary downloads use the sourceDir for the download path. 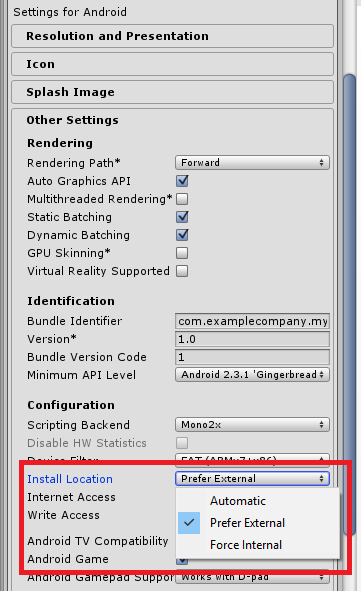 From your Unity project, click File-Build Settings…. 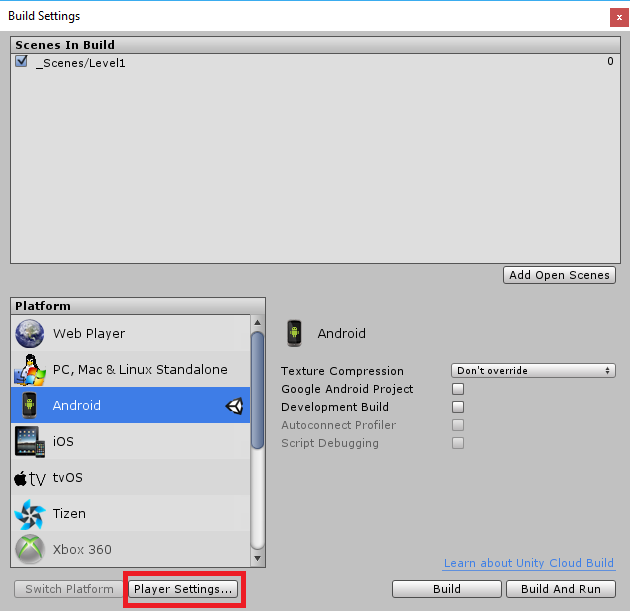 From the Build Settings dialog, select Android in the Platform list and click the Player Settings… button to display the inspector. Open the Other Settings section and look for the Install Location setting. preferExternal is usually the default – this is almost always the best choice. YoYo Games’ Gamemaker:Studio also uses preferExternal as the default for Android projects. Although you can manually change this default, it's recommended that you leave it as is. Other engines and development frameworks provide similar options. Consult the documentation for the tool you are using to make sure you are using are configured to set the installLocation to preferExternal in the APK manifest.